We all know to avoid certain foods (looking at you, sugar) to keep our teeth clean and healthy. But did you know that there are certain foods that you should be eating to make your teeth stronger? Caitlin Grimes, D.D.S., of StoneCreek Dental Care in Alabama, has compiled a quick and easy recipe that will help keep your teeth strong, vibrant and healthy for years to come (when combined with proper brushing and flossing, of course)! This recipe makes 4 servings with a prep time of 25 minutes. 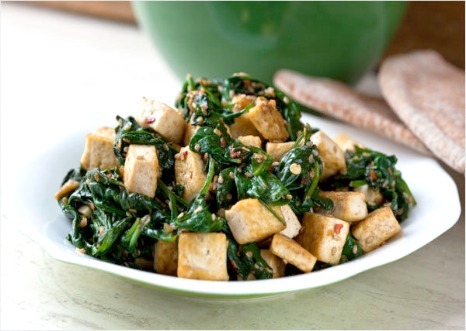 Lean protein like tofu contains phosphorous, which works with calcium to strengthen teeth. Dark, leafy greens like spinach are high in calcium and folic acid, as well as other essential vitamins and nutrients. Sesame seeds have calcium and magnesium, and can reverse tooth decay by remineralizing your teeth’s enamel. The ginger in this recipe also has anti-inflammatory properties — consider spicing up your diet with this delicious flavor! And if you’re just not into tofu, don’t worry — substitute chicken instead. 1. Heat canola oil in a large skillet or wok; add tofu and cook for 3 to 5 minutes. 2. Add ginger and garlic and cook for an additional minute. Add soy sauce to taste. 3. Add spinach and cook until wilted (about 1 minute). Add sesame seeds and more soy sauce to taste. Remove from heat. 4. Combine with desired grain (e.g., brown rice) or noodles. I want to try to use more healthful recipes. This would be a very tasty recipe to make and my family should love it.